Keywords: Sulfonamide, thermal heating, microwave irradiation, heterocycles, benzofused heterocyclic, nucleophilic. Keywords:Sulfonamide, thermal heating, microwave irradiation, heterocycles, benzofused heterocyclic, nucleophilic. 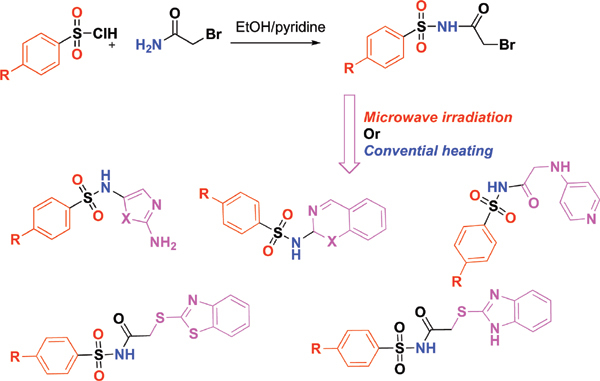 Abstract:Background: This paper describes the synthesis of novel fused heterocycles from the reaction 2-Bromo-N-(phenyl sulfonyl) acetamide derivatives with nitrogen nucleophilic reagents were carried out under microwave radiation and conventional heating. The synthesized compounds are excellent utilizing microwave irradiation rather than conventional heating.